A patient afflicted by a stroke in a hospital. Does this ambitious story succeed? Un patient atteint d’un accident vasculaire cérébral dans un hôpital. Est-ce que cette histoire ambitieuse est une réussite ? Un paziente colpito da un problema di circolazione cerebrale in un ospedale. Questa storia ambiziosa é riuscita? 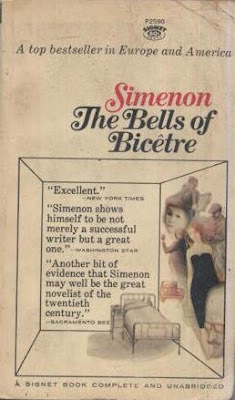 How well does Simenon handle medical details in chronicling the hospital course of a stroke patient paralyzed on one side of his body and unable to speak? Aware the author lacked personal experience, I had two questions as a physician: does the writer portray the case accurately and avoid being too technical for laypersons? A clot in a brain blood vessel renders 54-year-old René unconscious and, after he awakens, the author presents his functional deficits and narrates his stepwise recovery. For example, his right cheek “puffs out comically with each expiration” inflating and deflating “like a child trying to smoke a pipe,” a clever, exact way of showing that René “no longer controls his face.” He cannot smile for days, and when he does, he lacks the sensation needed to feel it happening, the same way he cannot feel needle sticks in his buttocks. Despite impediments in mouth, limb, bladder, and bowel control, René can see, hear, smell, and most importantly, think. Fully consistent with a stroke, the preservation of these abilities enables the writer to focus on his main theme―what goes on in an incapacitated patient’s mind. The patient’s “limbs no longer obey him,” but motor function begins to return by the sixth day. René can only bend his fingers and wiggle his toes at first, but voluntary control becomes more sophisticated and complete over time. Effective function requires muscular and sensory coordination as exemplified in the step-by-step way René resumes smoking his pipe. (This was not a forbidden pleasure for hospitalized patients during the 60s.) Unable to hold the pipe in his mouth reliably, he has to wait and work on preventing its fall into his lap. The days of recovery extend into weeks and months. René must drink liquids through a straw before he can at last chew and swallow solid food. He learns to manage left-handed writing clumsily and then shaving “but not without cuts.” Sitting up in bed makes him faint at first, but he gradually advances to successful, sustained wheelchair sitting. He achieves turning its wheel with his right arm, but pedaling a stationary bicycle wheel remains a challenge for his right leg. Over time―a very long time―René stands with two people’s help, then bears full weight on his right leg, and then walks within parallel bars, the tentative way children do “when they attempt their first steps.” In the end, René is walking with just one person’s help, but his recuperation has been so lengthy, “his room no longer belongs completely to the hospital” and he is wondering if he will ever “live like others” again. In sum, Simenon presents this medical case well. He employs a limited number of understandable words to indicate what transpires medically and dilutes the hospital experience of illness with flashbacks to good health periods in his protagonist’s life.